Have the Aquaman movie on your sonar with this amazing DC Gallery Ocean Master Movie PVC Statue based on the film! Arthur Curry, the Aquaman, faces off with the Ocean Master as a 9-inch scale sculpture. 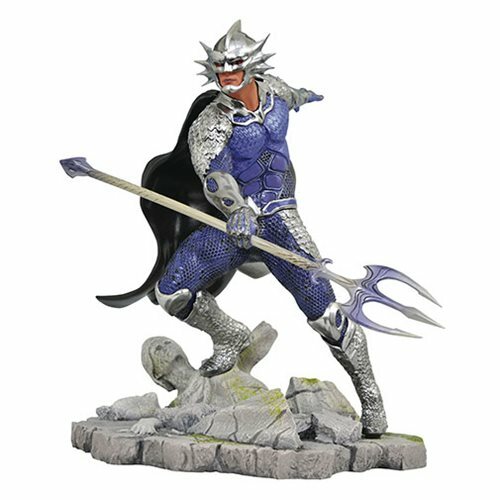 Featuring detailed sculpting by Rocco Tartamella based on designs by Mark Wong, the Ocean Master statue features amazing likeness to actor Patrick Wilson and fine paintwork that compares with a high-end resin statue. The DC Gallery Aquaman Movie PVC Statue is in scale to all other DC Movie Gallery PVCstatues (sold separately) and comes packaged in a full-color window box.